As the capital of Virginia, Richmond is the fourth largest city and the third biggest metropolitan area in the state. As such, it’s no surprise that many of the areas outside of the city are in high demand amongst homebuyers. These areas include those around Lake Chesdin to the south and Lake Anna to the north. Both offer a relatively short drive to the city with the opportunity to live in small, tight-knit communities with beautiful outdoor scenery. If you’re thinking about moving to an area outside of Richmond, here’s more information about each area and what they have to offer. Lake Chesdin sits on the border of Dinwiddie and Chesterfield Counties. It’s also commonly known as the Chesdin Reservoir. The reservoir has a drainage area of roughly 1,333 square miles, while the George F. Brasfield Dam is around 840 miles long. The 3,100-acre lake covers 4.844 square miles and contains about 9.66 billion gallons of water. Lake Chesdin is known for its great location. It’s just 40 minutes south of Richmond, and easily accessible from surrounding areas like Chesterfield, Midlothian, Petersburg, Glen Allen and Henrico and Hanover Counties. Lake Chesdin is also convenient to Hopewell, Dinwiddie, Blackstone and more. 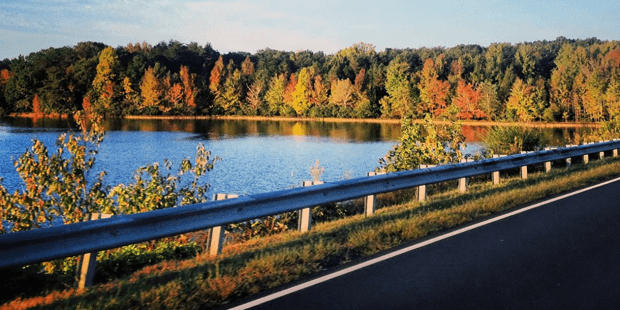 Lake Chesdin is also frequently visited by people from neighboring areas, such as Charlottesville, Williamsburg, Farmville, and New Kent, which are all between 45 minutes and 1.5 hours away. The size of Lake Chesdin means that residents of the area and visitors to the area have plenty to do on the lake besides just going for a swim during the summer months. Unlike many lake areas, there are also plenty of attractions nearby, as the lake is located close to Richmond’s suburbs. At Lake Chesdin, you’ll be able to easily access shopping, dining, and much more. There’s plenty of space out on the lake to go boating at any time. In fact, there are three different boat landings located around the lake, including at the VDGIF Public Boat Landing, the Lake Chesdin Campground, and the Whippernock Marina and Campground. If you want to go out on the water but don’t have access to your own boat, you can rent boats as well as kayaks at various establishments. You can even take a kayak tour through Eco Trek Adventures. Lake Chesdin is known as an excellent place to go fishing by the locals. Some of the fish available in the reservoir include largemouth bass, black and white crappie, walleye, striped bass and more. The public boat ramp is open 24 hours a day, while bait, tackle, and boat rentals are all available at the private marinas. Considering the natural beauty of the lake and its surroundings, it should come as no surprise that there are plenty of places to camp nearby. The Chesdin Campground is particularly popular and boasts a boat ramp, a playground, a volleyball court and a basketball court. The Whippernock campground and Cozy Cove campground are two other popular options. There are a number of excellent restaurants located right by the reservoir, including Terrace on the Green, Granny’s Kitchen, Joe’s Steak and Seafood, and El Caporal. Covering roughly 13,000 acres, Lake Anna is one of the biggest freshwater inland reservoirs in the state. Not only is it around 17 miles long, it contains almost 200 miles of shoreline. Lake Anna is located close to Louisa, Gordonsville, Spotsylvania and the neighboring areas. Lake Anna is also only 50 minutes from Fredericksburg and around 2 hours from the Washington DC metro area. Lake Anna is also convenient to Charlottesville at about an hour and 15 minutes away. It’s a little bit further from Greater Richmond – approximately 1.5 hours away. There are several official campgrounds surrounding the lake where you can enjoy the natural splendor of the area. These include the Rocky Branch Campground, Christopher Run Campground and the Lake Anna State Park. The lake was stocked with fish from the very beginning. Some of the fish you’ll find while fishing include largemouth bass, crappie, bluegill, channel catfish, walleye, white perch and striped bass. There are numerous marinas located along the shores of Lake Anna, including the Anna Point Marina, the Dukes Creek Marina, the Highpoint Marina and the Sturgeon Point Marina. There are dozens of restaurants located right by Lake Anna, including Callie Opie’s Orchard, Tavern on the Rail, Billikens BBQ Company, Anna Cabana Restaurant, and Chelsea Jo’s Restaurant & Sports Bar, just to name a few. As you can see, both Lake Chesdin and Lake Anna have a lot to offer for anyone looking to buy or build a new home within a short distance of Richmond, VA. Learn more about Lake Chesdin and the surrounding area in Chesterfield, VA by clicking here. Looking for waterfront properties near Richmond, VA? Check what’s currently available at Lake Chesdin by clicking here.